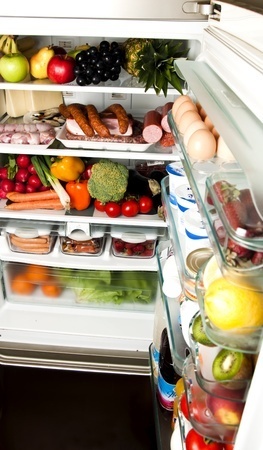 Do you know what's lurking in the back of your fridge? Perhaps there's a science experiment or two growing on the bottom shelf or some leftovers waiting patiently at the back to be used up. You could even have some veggies wilting sadly in the crisper, ready to be used in a soup or casserole or even a good stock. The only way you'll really know what is in your fridge, and how much money you won't be binning is to get that fridge cleaned, tidied and organized. To get started, fill your sink with hot, soapy water. 1. Empty the shelves. Put all the jars, bottles, tubes, individual sauce packs and anything else on the bench. 2. If the shelves are removable, take them off and wash them in that nice hot, soapy water and dry them thoroughly. If they aren't, get a wet washcloth and a tea towel and wash them thoroughly, wiping them dry as you go. Don't forget to wipe over the actual door panel. 3. Get a damp cloth and wipe over the seals, being sure to very carefully get into the seal proper, wiping out any crumbs and dust that have worked down into it. 4. Go through all those jars and bottles on the bench. Check the best before and use by dates. Anything past its use by, toss. Anything past its best before date, use your discretion. Anything you know you will never, ever use toss. Empty the contents into a bowl to go into the compost and put the containers in the recycle bin. Tip: If you have double (or even triple) bottles and jars of the same thing, check the best before date. On the jar that expires first, put a great big No. 1 with a permanent marker. On the jar that expires next, put a great big No. 2, and so on until all the jars are done. Now you know which jar or bottle to use first. As each one empties, put it in the recycle bin. 5. Put everything back, organizing as you go. Put sauces with sauces, all the salad dressings together, mustards together etc. 1. Start with the top shelf. Empty it completely. Remove it from the fridge and put it in the sink to soak. 2. Go through everything you have taken out. Anything you aren't sure of, compost. Put the jars, packets or tins into the recycle bin. 3. Wash and dry the inside of the fridge cabinet, don't forget the top. Unclog the drain if you have one in your fridge. Put the shelf back in place. 4. Repeat the process for the second shelf. 5. Take the crisper drawers out. Empty them, then wash and dry them thoroughly. 6. Any sad vegetables put aside to process for casseroles, stock or soup. Any science experiments add to the compost bowl. 7. Wash the sides of the fridge cabinet, paying particular attention the back and floor under the crisper drawers. These areas are notorious for catching spills and drips and hiding them until they are sticky, horrible messes. 8. Put the drawers back. You'll have a pile and a half of food on your bench and it's time to get it back into your fridge. How you organize your fridge is up to you. I keep condiments, cream, sour cream, butter, eggs, cheese and containers of beetroot, pineapple and sun dried tomatoes on the top shelf. I use a lid from a Décor container that broke as a tray to hold the jam, cream, sour cream, cream cheese, mustards etc. together. The tray slides out easily so I can get what I want and it keeps the jars together. On the second shelf I keep yeast, yoghurt, shake-n-bake, dried fruits and any prepared meals or leftovers to be used up. On the third shelf are two Tupperware vegetable containers (full of vegetables) and blocks of cheese and butter that are waiting to be opened. I don't use the crisper drawers in our fridge for vegetables; they keep much better in the Tupperware. On the third shelf, left-hand side is a square container. In it you'll find blocks of butter and tasty cheese, tubs of sour cream and cottage cheese. Next to it is a Tupperware container of chopped vegetables, ready to be used. The small green container holds mushrooms or spring onions. In front of it is the meat thawing for tonight's dinner. In one crisper drawer I keep fruit: oranges, apples, mandarins, lemons etc. In the other crisper drawer I keep vegetables. I use Gel Bags to keep the vegetables in the drawers fresh until they are used. Organize your fridge to suit your family and the way you work. Clear everything off the top of the fridge. Take all the pictures and photos and magnets off the door. Get a damp cloth and wipe it over. Pay special attention to sticky finger marks. Wipe over with a dry tea towel as you go. What are "gelBags?" and where do you buy them? It sounds like a very good idea to keep veggies and fruit for longer than they usually last.